Eileen Raymond taught for 18 years in university programs preparing teachers for serving special needs learners, after working as a special educator for ten years in US public schools. From 2005-2009, she was associate dean of the School of Education and Professional Studies at the SUNY Potsdam where she now holds the rank of associate dean and professor emeritus. In 2009, Dr. Raymond was a Fulbright Scholar at Nelson Mandela Metropolitan University in South Africa. She continues to work as a Research Associate with NMMU colleagues on curriculum development in teacher education and barriers to learning at the university level. Her current research focuses on issues relating to serving learners facing barriers to learning in inclusive settings. In addition to Learners with Mild Disabilities, she has written Making Inclusive Education Work in Classrooms (Pearson South Africa, 2013) with five South African colleagues. She frequently presents on topics of inclusive practice in the United States and internationally, with a particular focus on Universal Design for Learning. She is an active member of the Council for Exceptional Children, serving as President of its Division for International Special Education Services (DISES) from 2015-2017. Unit II Who Are the Learners with Mild Disabilities? 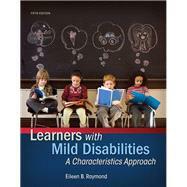 Unit III What Are Learners with Mild Disabilities Like?